Now that the appointment of Judge K is a done deal … what happened to the “credible charges” of sexual assault? There is no statute of limitations on that felony in Maryland, where the alleged attack is said to have occurred. The appropriate Maryland District Attorney should open a criminal investigation with all the FBI has gathered – and do its own investigative track down of any remaining loose ends; and if there is sufficient probable cause to believe Judge K committed the crime – arrest and try him for it. If he is convicted – then impeach him from the Supreme Court. IF – I repeat IF – there are actually “credible charges” sufficient in credibility to ruin a man’s life. If the goal was merely with insufficiently clear allegations to ruin his career sufficiently to deflect him from appointment to The Court … well, Justice Kavanaugh may, himself, have a very strong suit for defamation against the people who launched the public melee against him. The direct intention of destroying Kavanaugh’s career for political ends certainly meets the “with malice” standard of “mens rea” (state of mind, intention); and the charges not meeting the standard even to provoke the interest of the relevant District Attorney/Prosecutor is probably enough to get their international publication deemed “reckless” and “untrue” enough to meet the malice+reckless+untrue standard for a finding of guilty on defamation against Kavanaugh’s accusers. 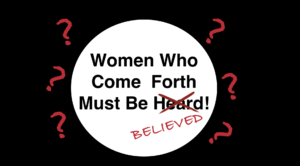 As Bill Maher said so concisely last week” The ‘Me, Too’ Movement (which I support to a great degree) has morphed the cause from ‘Women Who Come Forth Should be HEARD …’ (which is right) to ‘Women who come forth MUST be BELIEVED.’ – and that is not right. Charges of criminal misconduct must be vetted for sufficiency before being published, or they fall under the qualifying rubrics of Slander. Libel, and Defamation. Due process must precede destroying anyone’s name, career, or life. The Fifth Amendment demands it; as does “The Golden Rule,” which is the clearest litmus of sincere, rather than goal-driven ethics.